BTW, this post being moved to the TB forum is blatant white-washing. People are complaining here and on Reddit and nothing is being said. The devs have openly said that the forum setup isn't great in that there are 259735987395 boards, yet everyone posts on General. Moving things out of General is just burying the issue instead of addressing it. I could make a case that every, single post on General could be moved to another category, so please get on top of those as fast as you've moved this. Clearly, the message is that 0/6 platoons will happen unless you buy horrible new ships. Yes true that but with us at least not in platoon 3 or 4. I hope we get some response on this and a fix for the upcoming phases. Or let us know at least that this is the new policy to get more money out of us. Sure hope this lack of planning in how the platoons and ship squadrons were laid out for this rebel TB is an anomaly. Our guild isn't a max star TB guild so this is going to have an affect the wrong way for sure. Cg has the numbers - maybe it does work out for them and makes money. But I just think it’s a bad cash grab. There are a lot of toons and ships out now that cost a good amount of money to get 7* and if people want to spend , more power to them. But it is kind of wack to spend money on a toon for the sole purpose of just platooning them. I understand why platoons are there. For the guild strategy. But still kind of wack. If I didn’t misinterpret some of the road ahead.. I think there are some changes/betterment’s coming to Tb and TW. But as Kyno said it is a numbers game. Eventually your guild will be able to complete all of it just based off of gp. But by then it will be a different Tb lol and the opinion of recruiting a whale to your guild is still truly laughable. They have such a way. It prevents those new characters from appearing in the middle two platoons in each region. For some reason it's not working in ships today, presumably from some sort of bug. You are on their pay role or what? Come on you know as well that this is a mistake. As we can say since the beginning of TB it has always been that you can fill platoon 3 and 4 or at least 2 platoons. If it was the case like you said and try to defend we would have this "problem" since the beginning. Sorry sir but thats not the case. So lets the devs speak for them selves and don't be a goody two shoes even tho you are a moderator with all do respect. Why are people complaining? It has always been like this. Numbers game yes but we can fill it eventually based on overall GP no way! If they keep releasing marque toons ships just a few days before TB you are not able to beat it based on GP but based on how big your wallet is. I agree with the majority I think making a unit that is only available p2p (unless you horde many crystals for one unit) is not fair. I understand wanting g to give a player that paid a bounus or there really wouldn't be a point in buying the unit. So (as I think someone already said) why not make it the toon go I to platoons when they are f2p? People who paid can still help fill before other guilds plus they also get to actually use the unit for a few months. I don't buy units but I bet alot of people feel kind of burned having to use them to fill platoons and that's it, since very rarely do units in Marquee events translate to immediate use elsewhere upon shelling out the money for them. But that's my two cents. @Jenari_DwInZz_ just stating facts about the current situation. I didnt say it was right or wrong or even state a preference. Since they implemented this 3 locked, 3 open system. I have just accepted that I will never be able to fill all platoons and moved on. I know that eventually through either GP or better teams that I will be able to make up the difference that has been added to the advantage anyone buying all new toons gets. Since they introduced the system there has been no stated set to where these toons can be which means any guild could have 0 or all 6 platoons with brand new toons. It is an issue they have always said that the point of TB is to allow collectors to show off what they have. Bit putting marque characters and ships in makes it impossible for f2p players to be accomplished collector players. By comparison f2p players who want to focus on raid teams and pvp can be accomplished in those areas without spending money collectors cannot be accomplished in TB without spending hundreds. I mean, you can look at it either way. Either it gives p2p players an advantage or it gives ftp/light spenders a disadvantage. Either way, those who spend get a leg up due to this mechanic. I’m not a big fan either but it is what it is. At some point guild gp becomes high enough to negate any advantage anyway, so it’s really just another incentive that gives those who pay an early advantage. It's platoons. They help a little, but really not that big of a deal to fill all platoons. It's almost always been like this. If you're boarderline on a star, it may cost you, but for most people, you'll end up with the same number of stars. I've had this thought since TB came out and never have been able to fully rationalize it. I get that this is a fremium model game and they have to make money, but this one particular aspect bugs me. In every other part of the game through skill or some kind of tough to obtain (but free) setup you can not only fully compete it but even excel at it. TB on the other hand has a hard pay to win block basically with platoons. Without being able to complete 4/6 it is basically not possible to clear at max rewards unless as Kyno said you just way over GP everything which largely no f2p guild can do yet. Being able to work up to a soft cap is fine, like with raids, but I'd argue this is far from a soft cap mainly because depending on character release cadence that cycle it can have significant negative impact on the results. The development cycle and release of characters should NOT impact performance to such a degree. TB is also by and large established content and should be fully doable at max stars by the f2p crowd by now (at least the elite, which I doubt any can do without at least 3 or 4 whales/krakens). I think a happy compromise would be at least guaranteeing 3 or 4 platoons are without p2p characters/ships and then having at least 1 with p2p so we at least avoid not even being able to get the basic bonus like my guild this week with ships (and many others it sounds are in the same boat), while still allowing for a bonus to the paying crowd. The bonuses could even be tweaked a bit between lvl2 and 3 to reflect that if necessary. In my opinion, that would be more in line with the rest of the game design. My guild needed 4 sith fighters today, but thankfully we had 1 so we were able to do 3/6. 2/6 platoons without the sith fighter and new falcon is unacceptable on the 4th day in my opinion. The other platoons seem to be standard for 2 or 3 out of 6 without the paywall characters. This is way too aggressive in my opinion and it should be 4/6 without them. @JupiterBth it ain't me. I just play here. 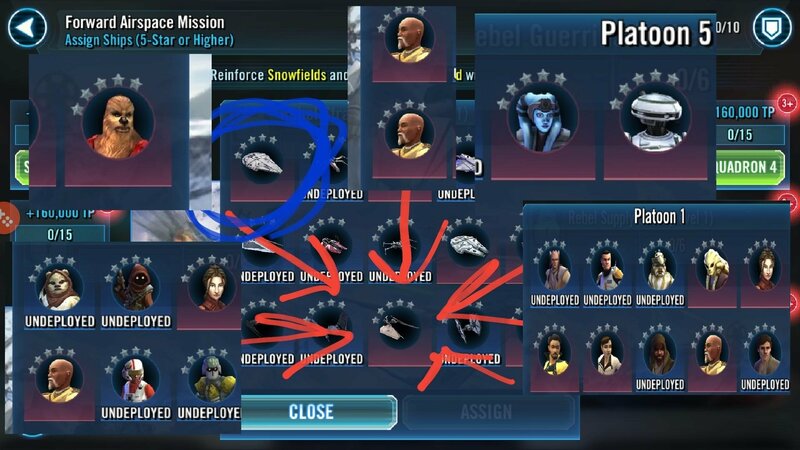 Seven freaking new falcons and 4 FOUR FIVE STAR the new just release sith ships required for the platoon to even do 2 of it TWO of it. I mean, who thought that was a good idea? Even guilds with whales would require multiples of them to complete even the five star level of this current light side TB. I mean come on. You can't farm the sith ship, or the falcon, you can't even get them in shipments right? And yet, you will what, need them all seven starred to do platoons at the last area? And the amount of carrying on here, . . Platoons are nice, but in no way are the critical to the phase. Y’all need to stop,focusing on the minutia so badly and look at the whole picture. Essentially, platoons exist to provide a small measure of assistance , temporarily, while you get your TB squads built, heck this is LS TB folks, use a res squad, it pretty nearly autos 6/6 at a low built status, those Phoenix y’all rag on, are able to auto combats, . .. Jedi , work pretty good now, . . Use your imagination and look for answers , stop laser focusing on the one aspect of TB that is ABSOLUTELY POINTLESS. An element you seem to be missing in your evaluations is frequency. Clearly the newly units are over represented, which is the main thing, and not whether they can spawn or not.